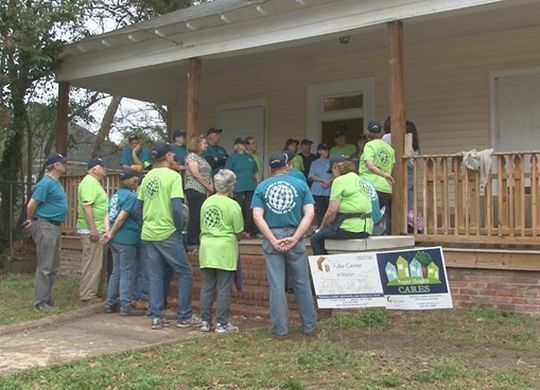 A group of 27 volunteers from St. Peter’s United Church of Christ of Elmhurst, Illinois, is spending this week in much warmer Macon, Georgia. But they’re not lounging in the sun; they’re working up a sweat as they restore a once-vacant home to like-new condition for a hard-working mother of four. Volunteer Scott Ahlgrim says it’s important to him and his fellow church members to put faith into action in this tangible way. “You know, it’s easy to sit in church and say, ‘We should do this,’ or, ‘We should do that,’ but it means a lot more to get some place and actually do God’s work,” he tells WMAZ-TV in a report that you can view by clicking the link below.